It has been a soggy few days in paradise. 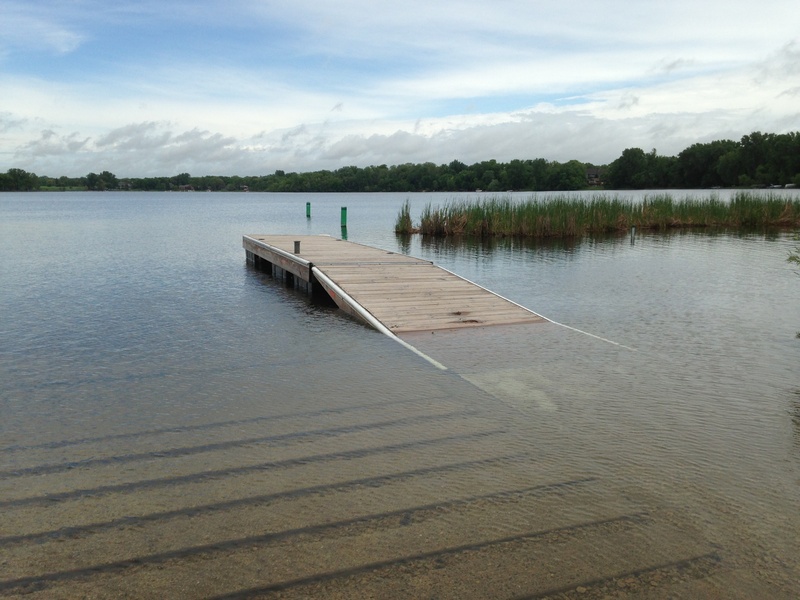 I know the monsoon season has never even heard of Minnesota, but here lately I tell you, you would have been hard pressed to enlighten me otherwise. Flash floods, and torrents of falling water. Gales like Joshua’s trumpets. Lightening bolts the shape of Idaho. Thunder so loud you swear mother earth had just split at the seam. Everybody, even the resident ducks, were to take cover from the tempest, huddled in our respective shelters, listening to the rain drum over the roof like pitch forks and hammer handles. Magnificent weather, to say the least. You cannot deny. But a might challenging, shall we say, in which to go outside and light the BBQ. What’s a pit jockey to do! Eventually tho, and mercifully, all the flags suddenly went limp, and a golden shaft of light pierced down from a gray sky. Water gently dribbled off the roof, and the tweety birds burped back to life. We all emerged from our holes, every living thing, scratching our collective heads, and admiring a world so fresh and anew. So wet and green and clean. And countless pools of standing water where water ought not stand. It wasn’t over yet, however. A glimpse at the Doppler radar revealed the bitter truth. That yet another green blob was advancing fiercely from the West. The short of it was we had but two, possibly three precious hours of semi-damp respite in which to frolic accordingly before the first, fat, rain drops spattered on the ground again. One hundred and twenty minutes or so, give or take. Well, under those circumstance, that was just long enough I figured, for a Patron of the Pit. Just long enough indeed, for a smoked meatloaf sandwich hot off the grill. Here is how to do it effectively! Truth be told this started out as a simple round of hamburgers, but after mashing about the ground beef a bit, you might say inspiration struck. I quickly cracked an egg over the meat, and added about a cup of bread crumbs. Squirted some ketchup in there, then some garlic and onion. An envelope of Lipton Onion Soup Mix. And maybe a few other things. You all have your own kinks for your meat loaf I’m sure. Do henceforth what moves thee. Anyways, I shaped the obscene looking meat muck into the relative dimensions resembling that of a wayward bun I had sitting about. I had an orphaned hoagie roll you see, one that I didn’t know what to do with. It was all alone, and frankly wasn’t reaching its potential. So why not match the meat to fit the bun, its common sense really. I ended up with an oblong loaf of meat about an inch thick, of which I dusted over in some Cajun seasoning just because. This was carefully placed on tin foil and put opposite the hot coals to tighten up there. After the meat has tightened up enough to safely pick the loaf up without destroying it, go ahead and get that tin foil out of there. You might be able to forego the tin foil stage altogether if your loaf is sturdy enough, but that is up to your pit master instincts to decide. Anyways, the sooner you get the foil out of there, the sooner then you can commence with the infusion of smokey goodness. 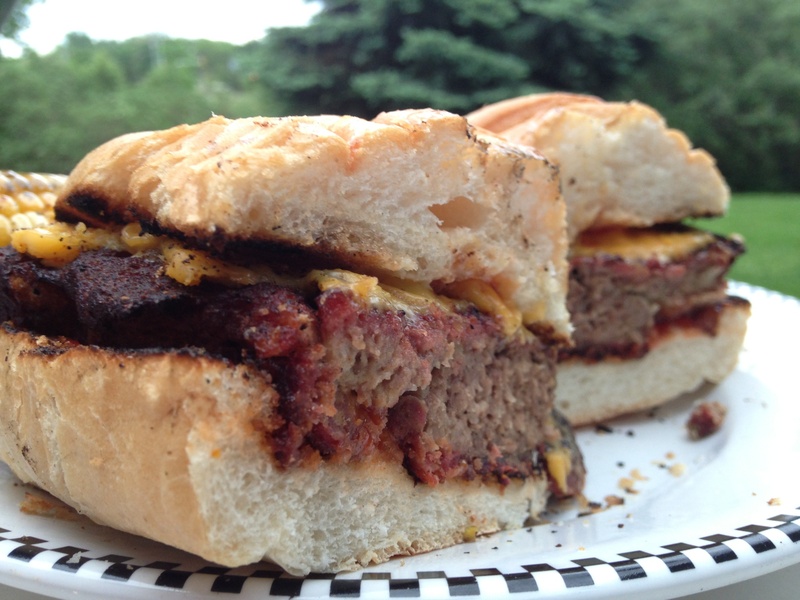 The smoke, after all, is what will set this meatloaf sandwich apart from any other. With eyes on the skies, we smoked this hunk of meat for a good hour in a continuous parade of curling oak wood smoke. And it was glorious. An entire hour in which to sit by the pit and do nothing at all. As usual, I was up for the task. Up for the undeniable attributes of not cooking in the rain. Like not wondering where the next lightening bolt may strike, or fighting a stormy gale. The way of course to grill in a monsoon is not to fight it, but to patiently hold your charcoal, biding your time. Like a adventure climbers who bandy together on the flanks of Everest, waiting on a small window of weather in which to assault the summit. And so it is today, and between the tempest, that we strike! Checking in on the plunder is OK. You may wish to turn the meatloaf from time to time, for even cooking. But always keep it tucked back, opposite the hot coals. When in doubt, go indirect people. Ten minutes from the end of the cook, we plunked on a naked corn on the cob, and roasted it over direct heat. Rotating it often with the tongs. A little butter and salt, man, is there anything better! And lastly we toasted up the orphaned hoagie roll, to add that extra touch to a meal well executed. And whilst we dressed the bun in mayonnaise and ketchup, we put a few globs of every one’s favorite ghetto cheese on the meat to melt. Mercy! Oak Smoked Meatloaf Sandwiches on a toasted hoagie roll. Oh buddy! It don’t get more comfort food than this! Just the ticket for what ails you, between the storms, and under fair skies. 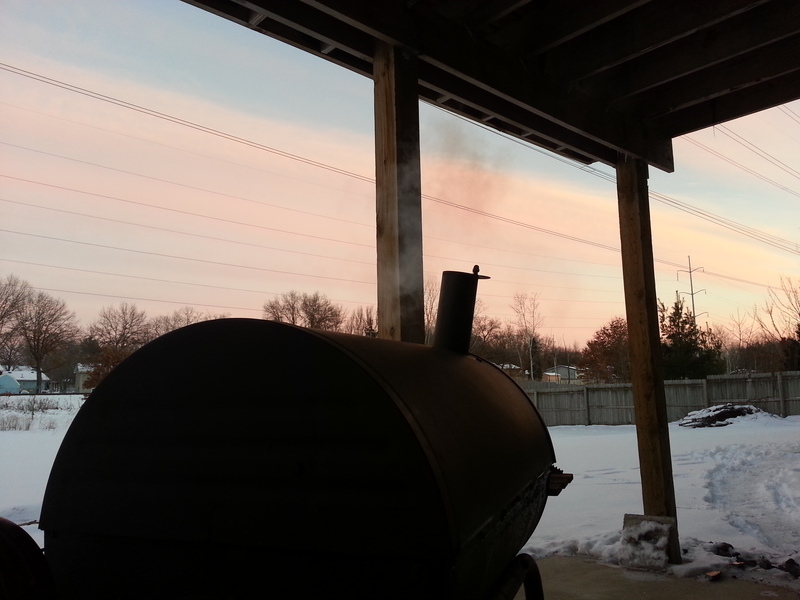 A thin-blue smoke, patron to the scent of hickory, curled serenely from the pit damper and dissolved into a pastel-gray, Minnesota sky. 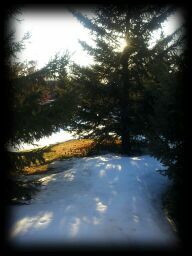 It is beautiful here today, as I stroll in the back yard, somewhat labored through the deep snows. Like walking on the white sand beaches of Waikiki, but without the hassle of sunburn, and crowds of oil-slathered humans, or sand taking up roost in your nether places. Indeed, here at the pond-side pit, the snow drifts have conspired tall, wrought from a winter ever-lasting, yet business anyhow, and steadfastly, carries on. Like the stately Cardinal, beautiful in his red and black plumage, making the acquaintanceship of the bird feeder, pecking through the safflower seeds there, as it dangles and swings above the pit. 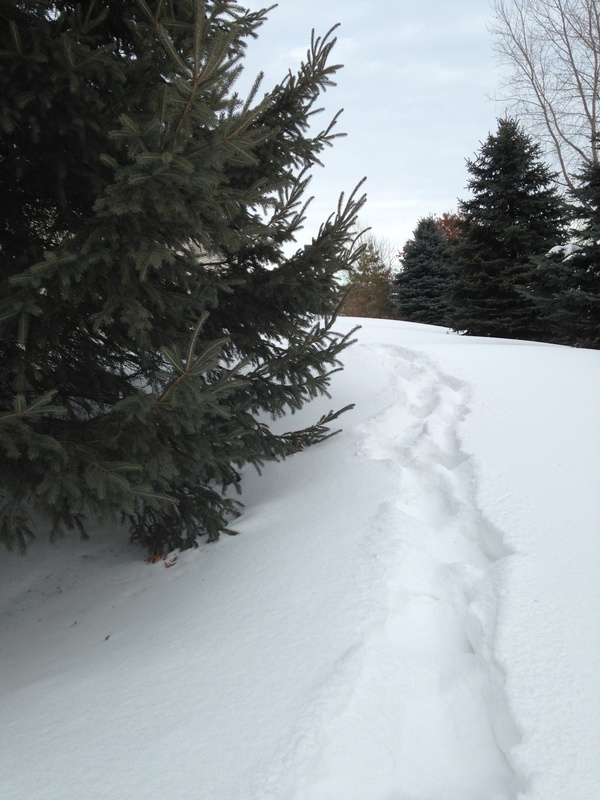 Or the tracks of the local rabbit, hopping through the deep snow. I do not know what he finds to eat in a land so harsh and bare, but he does alright I guess, doing what ever it is that rabbits do in the winter months. 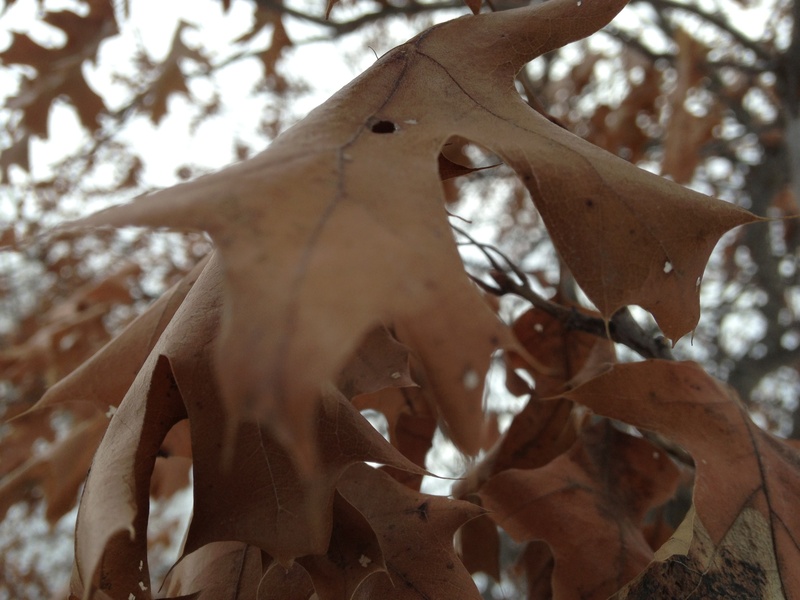 And then there are the leaves of the sturdy old oak near by, which I have always held an admiration for. Here is leaf that which turns but does not easily fall, clinging on through the winter months, like the last illuminated photons at the tail of a rainbow. A reminder that another season does exist. And that the sun will rise again over fields of green. I trudged back through the snow to the pit, hands warm in the pockets of my old woolen smoking jacket. I startled up some Black capped chickadees as I rounded the corner onto the patio, where upon I assessed the pit. 250 degrees and holding. A thin smoke gently wafting. It’s ready, I thought. Time to put the ribs on. And speaking of ribs, let me tell you a little more about them, and how they came to be, this lovely winter’s day at the pond-side pit. 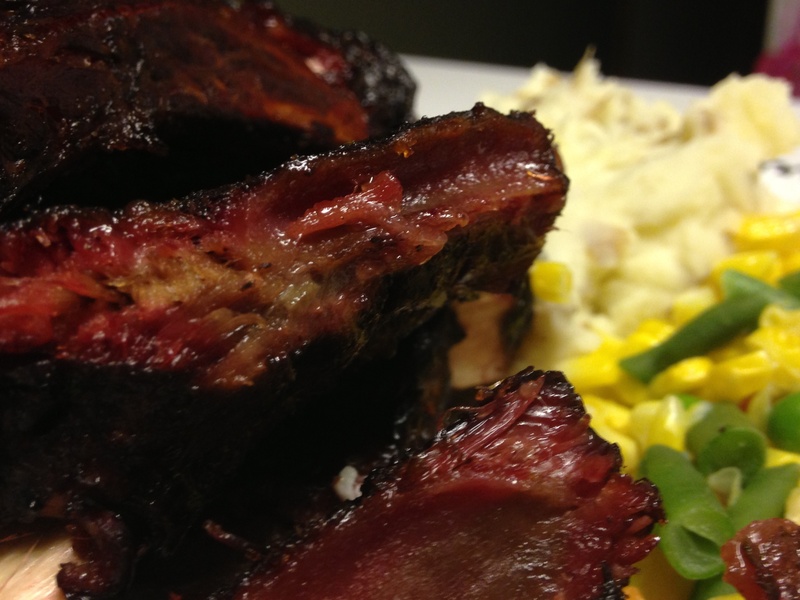 Today, a real treat, and one of our very favorites – hickory smoked beef ribs. If you haven’t yet had occasion to enjoy a good beef rib, rest assured it is a veritable no-brainer very much worth your time. They’re real easy to do too. To start, we ripped the membrane off the back side. Beef rib membranes can be tighter than a tick to a hound dog, but persevere and you’ll get it. Then we rinsed the ribs under the tap for to wash clear any bone fragments or the like. Then hit them both sides with some Famous Dave’s Steak and Burger Seasoning. Or you can just use a salt and pepper if you’d like. Or what ever elaborate rub you may have in mind. 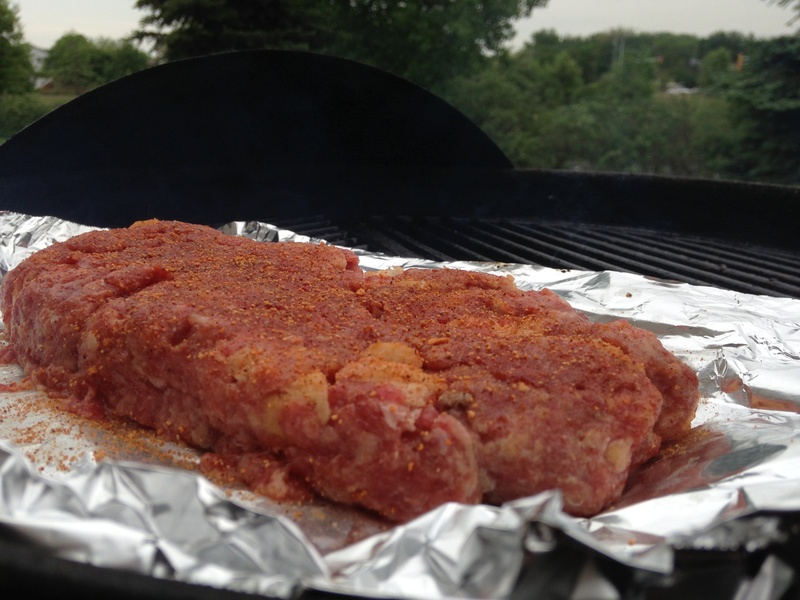 But if it’s a good cut of beef, simple is often all you need on the matter of seasoning. As usual tho, the pit master has the final say, along with the token first bite to see if he actually knew what he was doing or not. 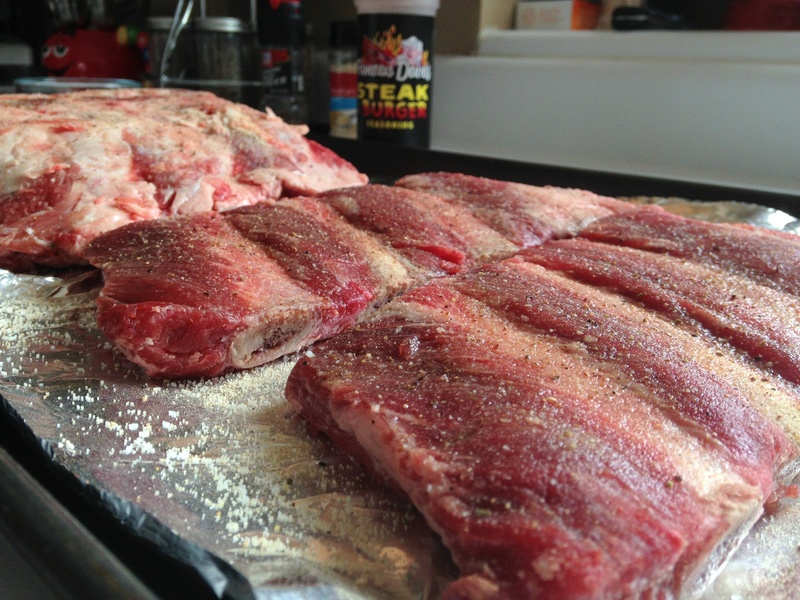 Anyways, that is about it for prep on these ribs. We thus put them on the pit, bone side down, and got along with the all important business of drawing a manly beverage from the ice box and taking up residence someplace cozy. Two hours passed, and maybe a little more than that, before I made my way out to the pit again, can of Coke in hand, to check in on things. The pit temp held stalwart, like Webers do, the smoke had mostly faded off, and the meat had pulled back a half-inch or so on the bones, which was right on schedule. Thus, and with little fan fare, the ribs were wrapped in aluminum foil, along with a splash of Coke for a steaming agent. Just a tablespoon or two is all that was needed. The rest was for the pit keeper! Foiled ribs and back on the pit, big lid replaced, and I was off again, striking an azimuth for my favorite man chair, remaining beverage in hand. I assumed the proper BBQ posture, and let the next hour or so take its course on me, as I dosed on and off, the Olympics bantering on the big screen, whilst the savory aromas of BBQ beef waft amid the patio environs. Dang people. I love smoking ribs! About an hour and a half in the foil is all it took. They were done. Once out of the foil, you can sauce it if you please, but we are so smitten with the flavor of beef, we left it just like it was. And it was spectacular. A deep red smoke ring, married with a robust beefy flavor. A touch of garlic from the seasonings. Very nice. And just what we needed up here on the 45th parallel. A little something savory to take the edge off a long, and very keen winter. A statement if you will, to old man winter’s steely grip on the land, that we keepers of the flame will carry on despite. Like the leaves of the old oak tree, we hang but on slight tendrils, quivering, waiting for the rising sun. Amen. 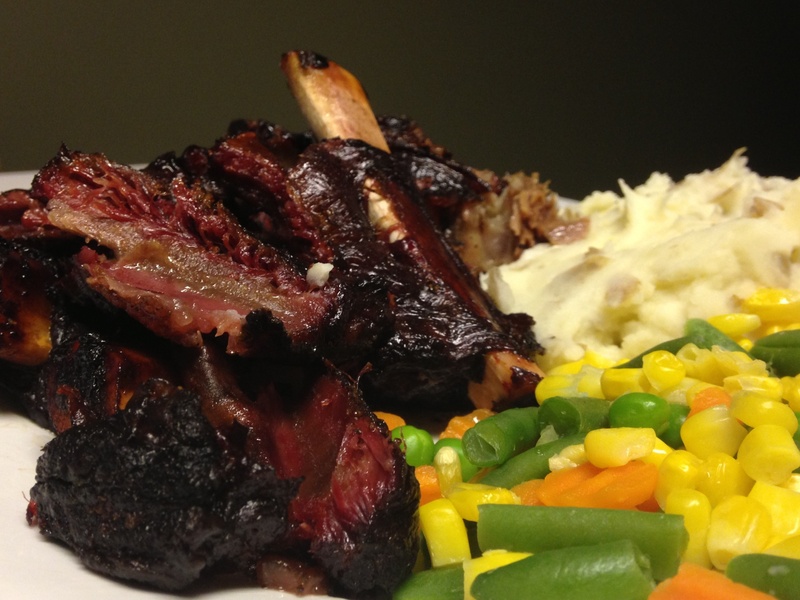 Savory Slow Smoked Beef Ribs over a Hickory/charcoal fire, sided with home-made garlic mashed potatoes, and a lovely vegetable medley for to please the lady folk. Yum is in effect! If this don’t help pass a winter day it’s probably too late! Here in Minnesota, when the weather starts to turn, and the temperatures fall to subzero levels, we the faithful remnant, who call Minnesota our home, have to partake in an annual ritual known as, “winterizing the house“. 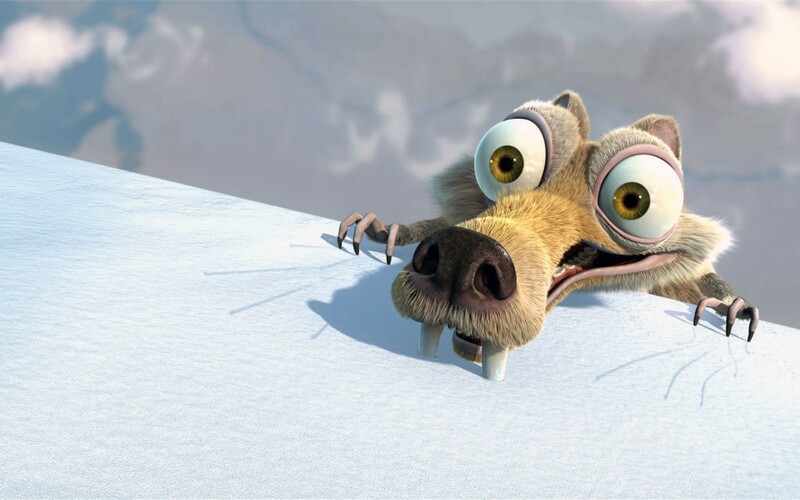 Now when winterizing the house, we do such things as adding more insulation in the attic to prevent any heat from escaping. We blow out sprinkler lines and insulate outdoor water faucets to prevent water freezing in the lines and bursting pipes. Some people do the bare minimum to winterize a house and other folks go a few extra steps towards convincing victory, under the flag of reason – better to be safe than sorry. 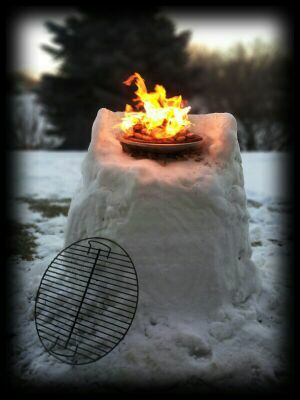 We Patrons must also do the same in preparation for Minnesota’s wintry grilling season. As the temperatures drop and our bodies begin to acclimatize, we also must take the proper steps so we don’t lose that much coveted heat, or even worse…our pipes bursting. Now some Minnesotans do the bare minimum to prepare themselves for the winter months, but we Patrons of the Pit, we will always take a few extra steps because as mentioned earlier, it is better to be safe rather than sorry. We think so anyways. Here at the Pit the proper attire for keeping cozy in the frozen out-of-doors is like second nature. For we are both fans of winter camping and so long johns, hats, gloves and even our smoking jackets are never an understatement. We are a rare breed; we take great delight in sitting beside our smoky pits, and as its chimney puffs away we might light up ones pipe and take in a good English tobacco. As the harsh winter winds slap sharp snowflakes across our face, we fill our trusted Stanley thermoses with our favorite hot drink, and sip away. As the temperature plummets past zero we begin to hug the hoods of our pits while a small camp fire may join us during a bitter cold smoking session, sharing in its efforts to keep us warm. Therefore, insulating the inside of our bodies after standing outside at our Pits during one of our famous blizzards is something we can always work on. 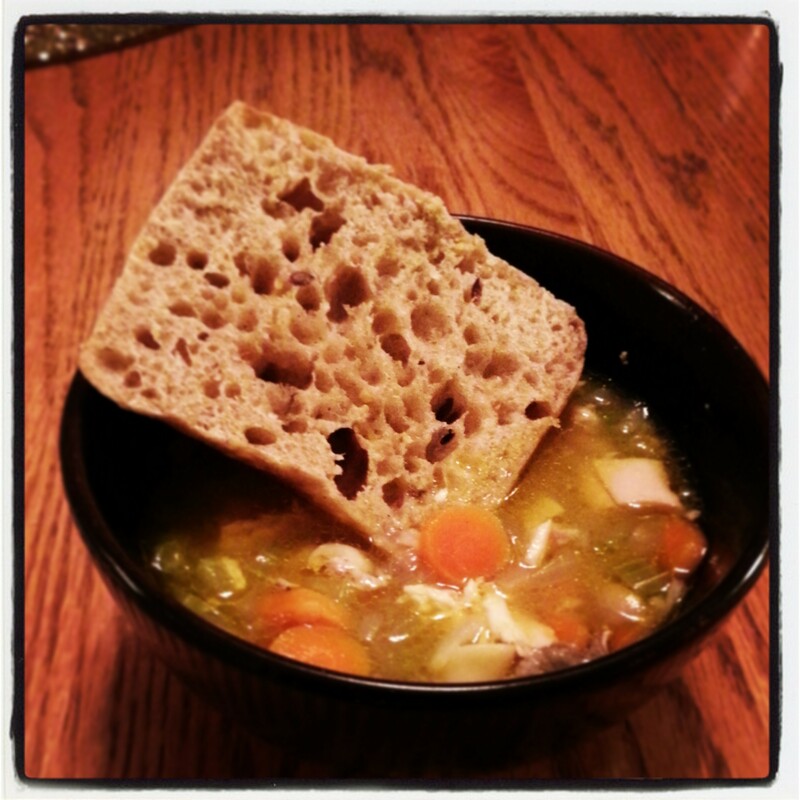 This weekend we started that process with Homemade Chicken Soup. Put the chicken, carrots, celery, onion, in a large soup pot and cover with cold water. Heat and simmer, uncovered, until the chicken meat falls off of the bones (skim off foam every so often). Take everything out of the pot. Strain the broth. Pick the meat off of the bones and chop the carrots, celery and onion. Season the broth with salt, pepper, chicken bouillon and Garlic Powder to taste, if desired. We added a can of Cream Of Chicken Soup to thicken the broth up a little. Return the chicken, carrots, celery and onion to the pot and stir together. At this time also add the noodles and wild rice. Cook until Noodles and Wild Rice become soft and serve. There is nothing better than dumping hot soup down one’s gullet and bringing a sudden rush of warmth to our bodies, thus beginning the process of acclimatizing our bodies from the inside out. Over the next few months, we might surprise the blog world with recipes for keeping one’s self warm and well insulated. 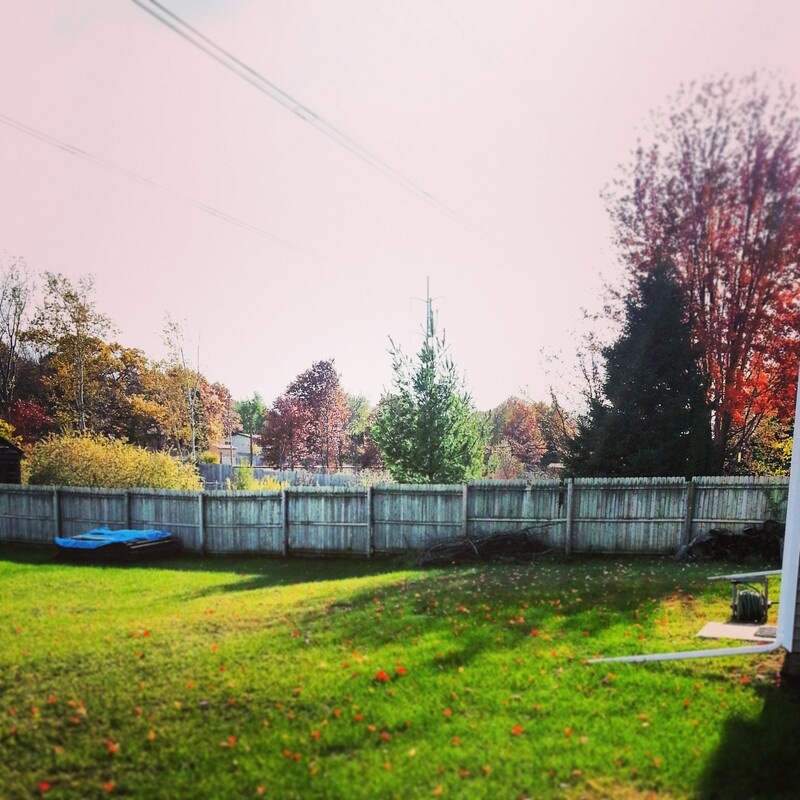 So, let the process of winterizing begin. Our fellow patron host is on vacation this week. He has traveled much this year, and as usual, he has some things to report from the field. Like when he visited Arizona earlier this spring, and discovered the Dip Lady. Or when he was up in the wilds of northern Minnesota a few weeks back, and won the great 2013 Burger Throw Down there, with his pine-apple topped blue cheese jerk burger. This week he finds himself in Door County, Wisconsin, a lovely tendril of real estate patron to a mid-west sort of paradise. He’s loitering in a quaint country cottage there, and reports back to us his latest supper from the grill. The man is clearly on vacation. There are times when your mind needs to slow down. When your body needs respite, and life just needs to take a little break. A small cottage in the middle of Door County, Wisconsin, is just a place to do such things. Though the six-hour drive may seem long, pulling into the driveway there is the moment when the cares of this world seem to leave. When life, work, and responsibilities back in Minneapolis begin to disappear. Though I’m not going to write about my worries and cares, there are a few things I can honestly say allow me to let the worries of the world leave for a few hours. And that happens usually when I’m cooking, and mostly when I’m cooking for other people. Which was one of my few responsibilities while spending six quick days in Door County, Wisconsin. Pork chops are this evening’s canvas for the variety of flavors I’m able to add to them. Mustard, cracked pepper, salt, and brown sugar to start, and finished the it all off with a medium baste of bbq sauce. And of course I’ll perform with the indirect method. We want to be able to cut these chops with a fork. Ahh, this evening’s “chef-d’oeuvre”. 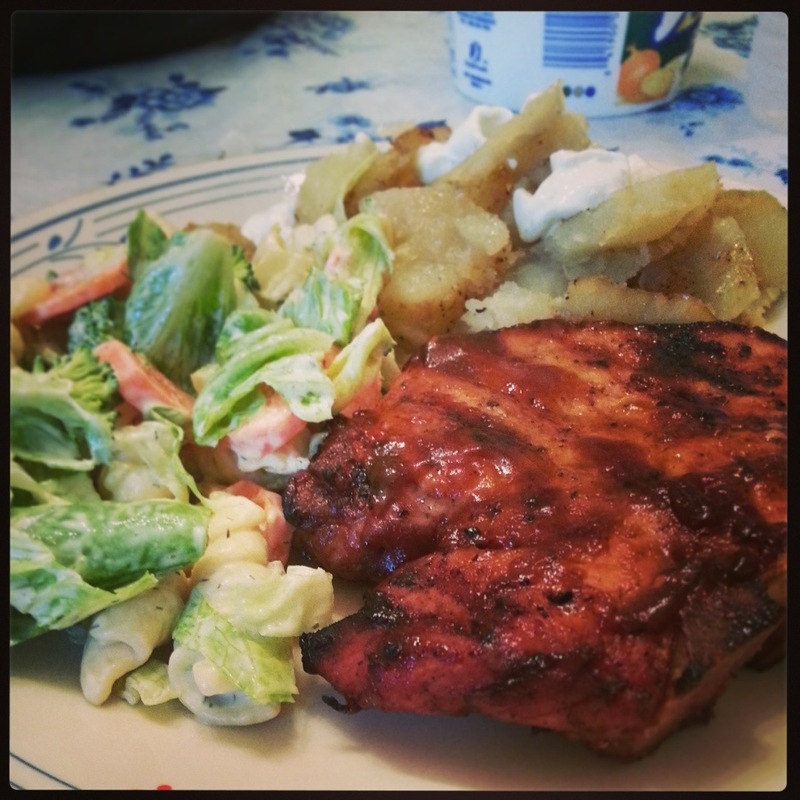 A BBQ glazed pork chop with a fresh garden salad. Oven baked potatoes topped with sour cream and chives. I only heard a few choice words during dinner. Allot of yums, mmmms, and a couple of wows. I walked away knowing the lack of communication was a compliment. 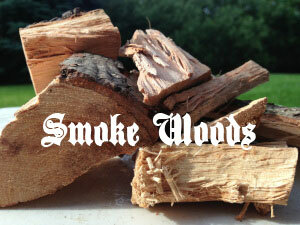 The other day, I read with some interest, the comments you readers had for my first smoking project. I was deeply humbled by your concern for my well-being during this experiment with my Kielbasa. I assure you that I am fine, and though my bride raised her eye brows at the first taste of the mystery smoked meat, she did in fact eat it. She said nothing unprintable, so to my way of thinking, I took it as a sideways sort of complement. For the record, I thought it was pretty good.Since that cook, little brother has taken me under his wing and is schooling me on the “Smoky arts.” He visited me one day, loitering in my driveway camp, expounding on the virtues of wood, explaining this and that, trying to get my enthusiasm up. 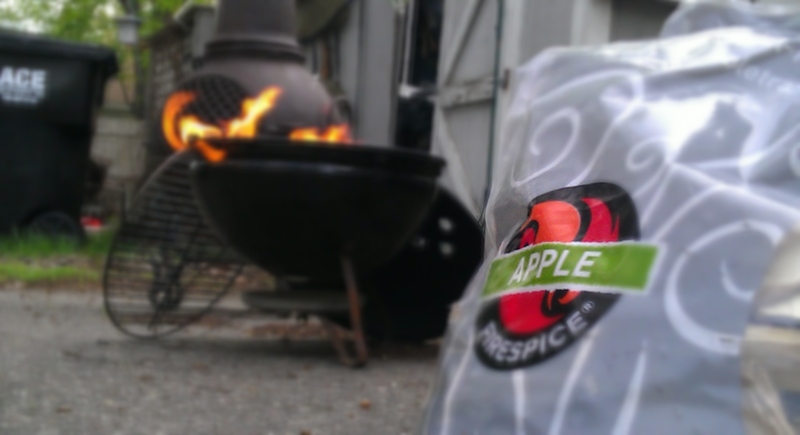 He explained how the mild Apple smoke would enhance my meat ,what Hickory would do for ribs and such. He lectured on Rubs and Marinades. I got within twenty feet of my Lilac bush before I heard him holler “Stop”! Like he would to a dog running into a busy street. Likewise, when I picked up a Maple tree branch from my front yard, left over debris from winter storms, I glanced furtively over at brother. His eyes were closed, his chin was sunk to his chest in dispare, slowly shaking his head back and forth.I guess I was not impressing my teacher too much…At this point Little Brother stood up, glanced around and stated flatly, “I gotta go”.And that was that. I was on my own again.I could tell that my brother was a little bit displeased with my lack of attention to his teachings, so I was going to do something about it. I would go to the store and buy some of those dad-burned wood chips. I would get wood with a label on it, so that next time he cornered me,and wanted to know what the heck I was smoking, I could tell him! Fifteen minutes later,I pushed through the door of the hardware store like a gunman walking into an old western saloon. I stopped for a moment, studying the room and the sauntered over to where the barbecue grills were sitting in all their glory. I casually lifted a lid here and there , checking things out, trying to look cool while searching for wood chips. Golly, there was a lot of paraphernalia for smoking. There were four different kinds of thermometers, and half a dozen tongs to choose from. Then along the bottom shelf I found the wood chips.I found a lot of wood chips. I had no idea there were so many different kinds or what they were even used for. Pecan, Hickory, Apple, Peach, Grape, Mesquite, Cherry and I thought about that branch in my yard when I read the last one, Maple. About then a young gal came over to me, one of the clerks at the store, and asked me if I needed help. I glanced up from my kneeling position at the wood chip shelf, and asked if she might have a preference for one kind wood over the other. I stood up a little straighter, a little bit of pridefulness swelling in my soul. I was enjoying this. “OH, I like to dabble a bit” I said. I walked out of there with my chest pushed out,apple chips in hand and pride in my stride. Yup, I was one of those guys. I was on my way to becoming a patron of the pit.Back home I was excited to get the little Smoky Joe into action. I placed my seven pieces of charcoal gingerly onto the residual pile from the last cook, and lit up. 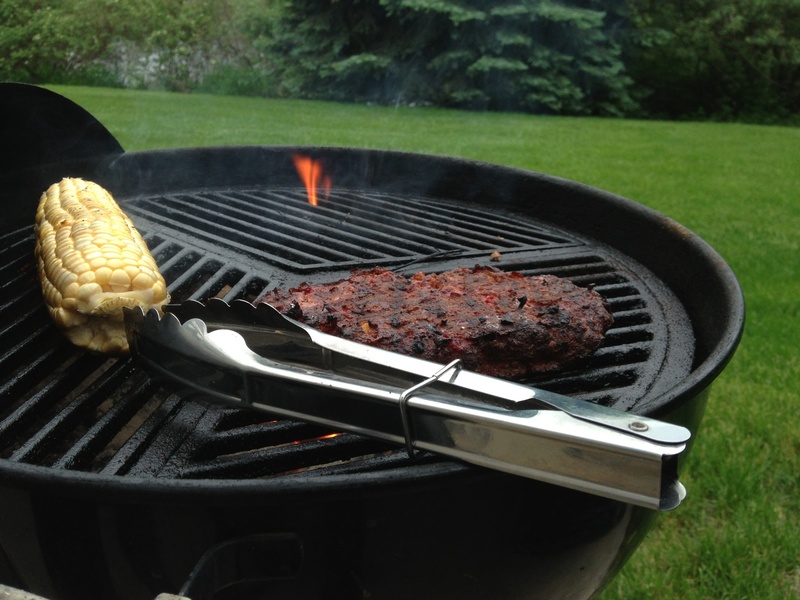 I watched the flames for a while, mesmerized by the aroma of the smoke wafting out from the little grill. Back in the kitchen I prepared for the event to come. 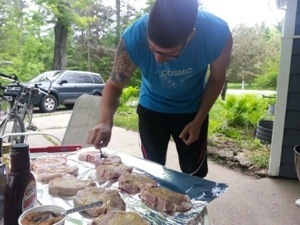 I had nice thick Pork Chops laid out on the cutting board and started to put the seasoning on, or “Rub” as my brother would say. I gently padded and rubbed the meat, trying to emulate my little brothers technique. I really did not know what this was all about, Me? I prefer to pat and rub my plump belly after I eat the meat. But then I respect little brother. After all, he has a Blog, I do not…While all this fondling of meat was going on, I had dutifully been soaking my apple chips in a bowl of water. I will tell you this, they looked just like the chips from the wife’s flower garden. I did the obvious calculation and discovered that it would cost well over a thousand bucks to do her flower beds with this exotic wood. Lucky for me, I only needed a small handful accomplish my needs.Wood on the coals, meat on the grill. I was doing it. 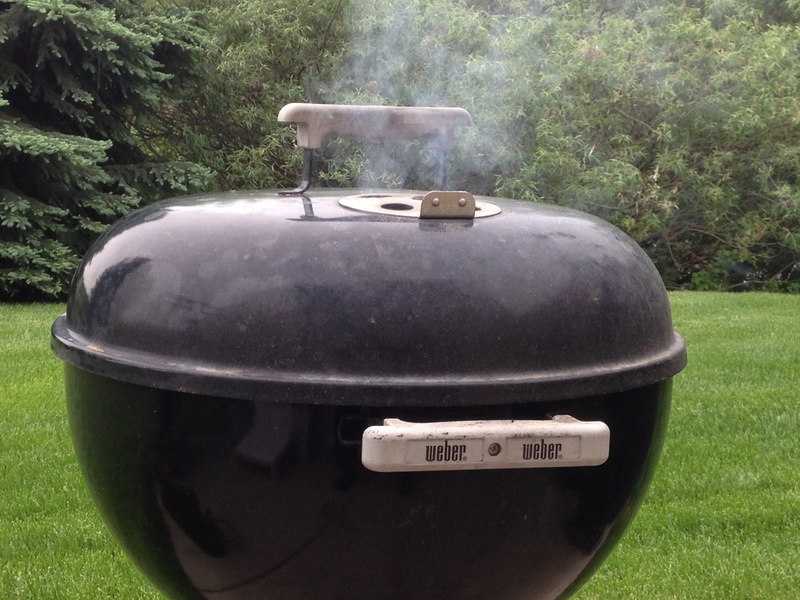 I set the little lid on the little Weber and waited, soon puffs of smoke started rising through the holes in the lid. Alright! I sat there in wonder, the magic of the smoke drifting around my camper and driveway. I was surprised that people were not stopping along the street in front of my house to witness this extraordinary event. An hour later, after shutting down the little grill, I brought my prized meat into the house, the perfume of the apple wood smoke lingering in the air. Gosh, this was good stuff. Brother would be proud of me. I had done a good thing here! I laid miraculous chops alongside the chopped potatoes that I had cooked in foil down in the coals during the cook. The presentation was completed with a dappling of steamed peas and carrots nestled into the grouping. I work second shift, and as such rarely am home for supper, but I am the cook of the house and I cook for my bride almost every day. When she comes home, there is some kind of supper for her in the refrigerator, waiting for her to heat up. Today was no different, I placed cellophane over the plate and placed my prized meal on the refrigerator shelf like I was setting up an entry for a state fair competition. I would have the left overs when got home from work. While I was at work, I could smell the distinct aroma of the apple wood,still clinging to my clothes, off and on the whole night. I wondered if anyone else could pick up on the scent. Each time I picked up the fragrance, I would get a flashback, seeing the smoke puffing out of the grill, the smell of the kitchen as I put the meal together. Man, when the bell rang and my shift was over I could not get home fast enough, I was ready to taste the spoils of my toils. My wife was fast asleep when I got home, but I hardly cared, I was like a kid at Christmas, I had been thinking about those pieces of pork for nine hours. I went straight to the fridge and swung open the door. My mouth was watering as I stared blankly into the empty space that once held my long waited supper. Nothing was there! I glanced feverishly around the kitchen, what the heck! Where was my supper? I looked in the freezer, and finally in the sink, and there found two dishes, remnants of meat stuck to the dirty edge of one plate. A stray green pea off to the side of the other. It became obvious that my supper was gone. I started at the plates, lifted one gently and took a whiff. Ah…the smell was still there, the fragrance of success. I set the plate back into the sink, leaned my hands on the edge of the counter, and smiled. The loss of my supper was also my gain. It meant that I had passed a test of sorts. I had smoked meat, and it was good. Good enough that my bride ate it all. I was now…a “Patron of the Pit”. Early spring in Minnesota. Melting snow, and river-lets of ice water meandering down the streets. Bird song returns to the barren tree tops, and the sun feels just right on your shoulders. Oh how we love this time of year. Just the mere thought of feeling the warmth from the sun again, not only registers as an event, but it is therapy too for the soul. For here is a simple pleasure, this light from on high, that has spanned the vacuum of space and landed precisely on your corner of the earth. Kissing your cheek there, like it had nothing better to do. That gives a winter riddled bloke hope, I think. And engenders in one’s brain pan those long but dormant notions of golf clubs, and fishing poles. And motorcycles and BBQ’s. 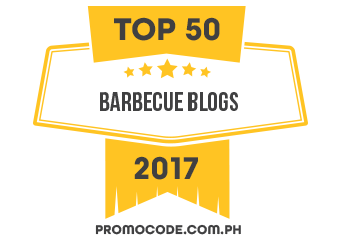 The latter of course, something we here at this blog have never put away in the first place. Even so, as I banked the coals this evening to the side of the old kettle grill, I gloried in the purified air that spring seems to usher with it, and how a patch of grass in the spruce grove yonder, is flooded now, in a golden light. It is a pleasure to tarry by the pit on days such as this. 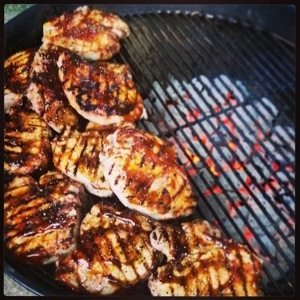 And on the grill tonight, now that you mention it, apple smoked, honey tinted pork chops. Man! Are you ready for this! Coals assembled like a flaming choir to the side of the pit, for proper indirect cooking. The chops were thus lightly rubbed in honey, and then sprinkled with some homemade spice, fresh out of the mortar and pestle. Now when you put sugar based things like honey on your meat at the beginning of the cook, you do increase your odds of burning things . But I didn’t care. With proper pitmanship, one can minimize the sugar rebellion, and procure some dang fine vittles. Thus, I went light on the honey, kept the meat well away from the coals, and just baby sat the beautiful pork chops, giving them almost all of my attention. It is a great hardship I suppose to sit tight to the grill, enjoying its radiant heat like that of a pot-bellied stove, whilst listening to the tweety birds cavort in the Alders. To at once let up on the accelerator pedal of life, and fancy the view of the world spinning with out me, whilst the apple wood smoke rises unto the heavens. This is a great pain indeed, these rigors of the BBQ arts, but one I am willing to endure now and again, for the assurance of delicious meat hot off the grill. 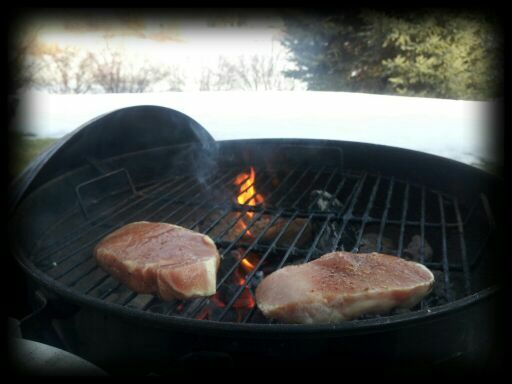 So it was, under blue skies and the banter of returning birds aside dwindling snowbanks, and warm sun beams cast upon my small little corner of the world, thy chops were dutifully grilled, with a touch of smoke, just because. Continually flipping them, nurturing them, ensuring they are having a good time there opposite the hot coals. I know I was. The aromas at the pit were a melody of inspiration, from the apple wood, to the caramelizing honey, to the fresh ground coriander and rosemary that my fellow patron gave me, as a token of good pit gesture. A spice rub we used in the Dual Patron Cook Out blog, consisting of brown sugar, Himalayan Pink Salt, onion powder, pepper corn, smoked paprika, coriander and rosemary. An agreeable host of aromas in which to aptly tarry by. And as I did precisely that in my patio chair, aside the smoking pit, I noted to myself how nice it was to be doing such a thing as this, with out a jacket, no less. 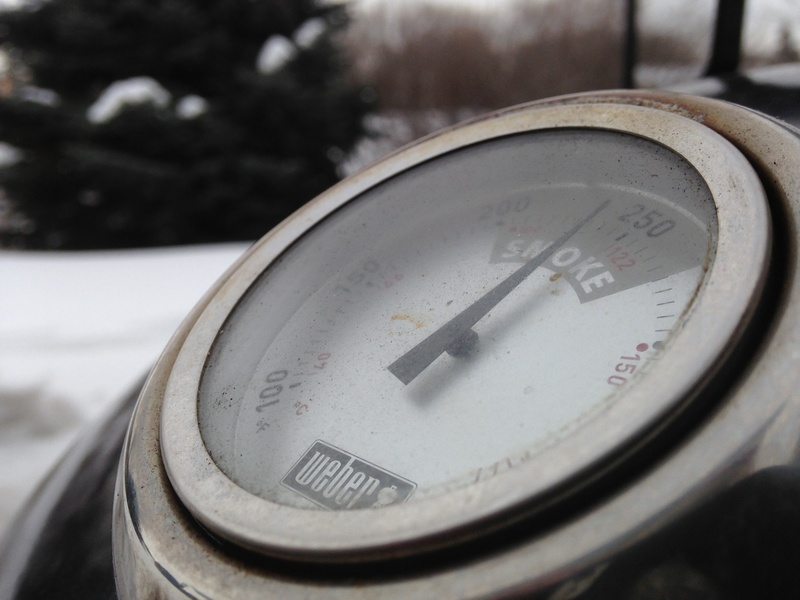 The winter grilling season, and those 20 below cook outs, might I wager, are on it’s way out now. Confirmed yonder, by the melting snow, the bird song, and the golden rays of sun residing on a scant patch of grass. Oh yes, we love this time of year. 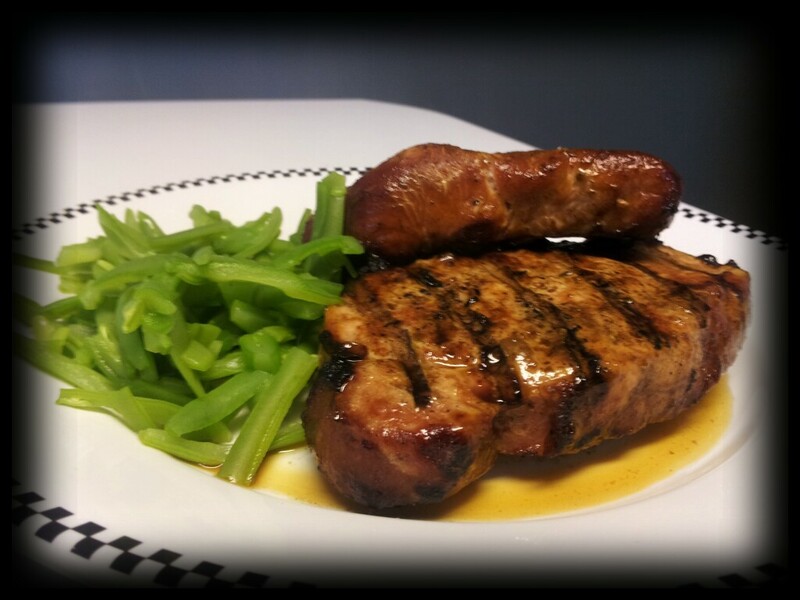 Apple smoked, honey-tinted pork chops, with freshly ground, aromatic spices. You could do a whole lot worse I suspect, but not have nearly so much fun. Gentlemen. 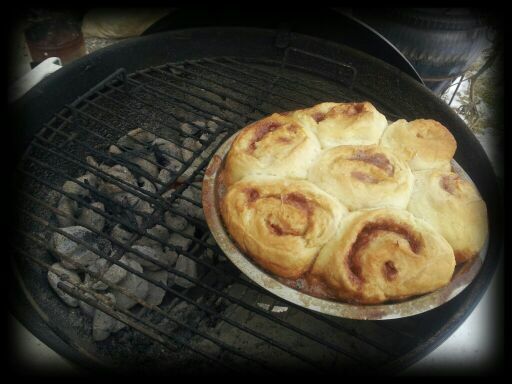 A few blogs back we showed you how to impress a woman by baking her bread on the grill. Women chimed in from all across the blogosphere, and were impressed left and right, and a good thing had been done. Women began at least, to foster a modicum of hope for us. But the ladies in our life are worth more than a mere loaf of tenderly grilled bread. They’re worth some dessert too. Thus it is time now for the encore, if you will. Time to take our efforts to the next level. 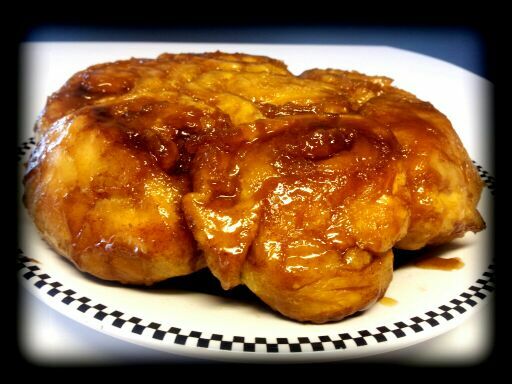 It’s time to make some caramel rolls on the grill, because if that don’t astound the female species, nothing will. Come with us won’t you, and we will show you just how to do it. First thing you’ll need to do if you haven’t already is to go back and read our article, How To Impress a Woman: Bread! 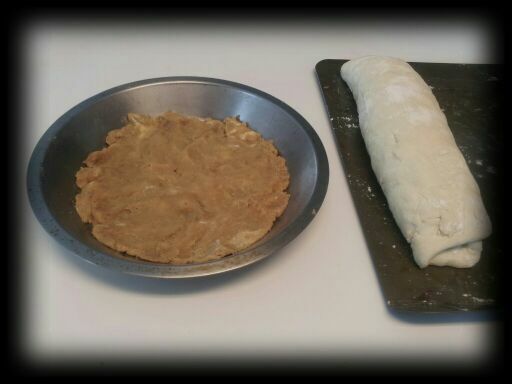 You’ll need to use the Master Recipe found there for the dough. Yes, the exact same dough you use to bake bread can also be used for the most delicious, home-made, caramel rolls you’ll likely ever ingest. So you’ll need to make yourself up a batch of that dough, if you wish to try this amazing treat. Whence the dough is made, grab a grape fruit sized chunk of it and plop it on a pan. Next, you’ll need to roll it out to a 1/4 inch thick. I couldn’t find my roller, but discovered a Quaker Oats oatmeal can rolls pretty nice instead. It’s all good. 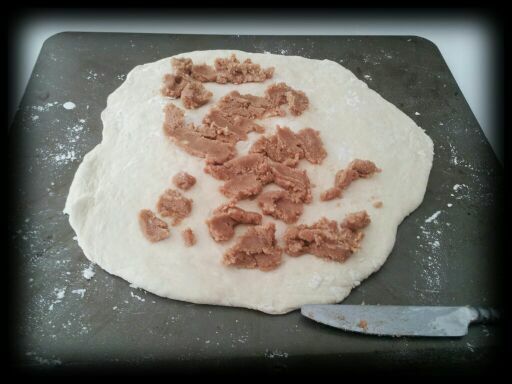 Anyways, then you’ll need to spread the filling out over the top of the dough. Here is how to make that filling. Cream all this together in your Kitchen Aid or what have you, and plop it over your rolled out dough. Don’t worry about how pretty it looks. Whence that is complete, go ahead a roll it up into a shapely log resembling your fondest burrito, and then let it sit and think about its life whilst you tend to key goodness factor – the caramel topping. Cream together all this stuff too, and spread it over the bottom of a pie tin or the like. You can sprinkle some pecans over it here too if you have any on hand. Next thing on the docket is to slice up your burrito, cutting cross sections every two inches or so, and place them in your pan directly over the topping you spread out there. The hardest part of this project is done now. If you made it this far, you can accomplish this masterpiece. Now it’s time to motion for the pit, back into our element. Where the pine-scented breezes mingle with the aromatic virtues of burning charcoal, and the banter of the flirting Chickadee. Put your precious cargo on opposite the hot coals. Indirect is your mantra here. Abide by it, and be well. This is no dish to screw around with. We tossed on a few pieces of peach wood at this point, that had been soaking in water for an hour or so. This project requires a delicate smoke, a wee bit, just enough to let you know these rolls hail from the smokey realm, but not so much that it over-powers the whole thing. Treat the smoke as a spice, not an ingredient. 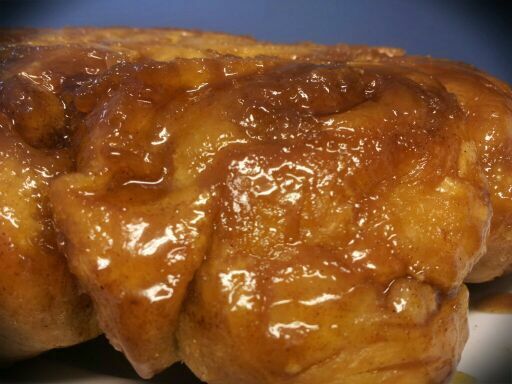 The light smoke and the caramel produce an unlikely yet worthy bond, that will set these rolls apart from any other. Yet another privilege of a pit cook. Put on the lid, and assume your standard pit master position – in your man chair, lovely beverage in hand, and wait for the awe-inspiring aromas to hit you. Whilst its baking, because your working a pit with varied temperatures running through it, you will want to lift the lid and check in on it from time to time, rotating 180 degrees at least once, and otherwise follow your pit master instincts for even baking. And like most baking projects, you’re looking for a golden brown crust to form, of which you should see in about 30 – 40 minutes. Keep checking in on it, be diligent, re-assuring it that you love it, and care about it’s well-being. Part of impressing a woman is being thoughtful and considerate you see. Best to practice on your caramel roll first if you have to. Whence a golden brown crust becomes the standard on your rolls, and it looks akin to something you think you’d like to eat, go ahead and proceed to the fun part – inverting it on a plate. Keep the inverted pan on top of it for a bit, tarry there, letting the piping hot caramel ooze and dribble of its own free will, where ever it so pleases, thus soaking into and over your rolls in a fashion suitable for the prestigious likes of Betty Crocker and your favorite grand mother. Folks will smell something good at this point and jockey nearer to thee. Look them in the eyes, pausing for effect, and remove the inverted lid, and proceed at once to astound the nearest woman. And maybe even yourself too. 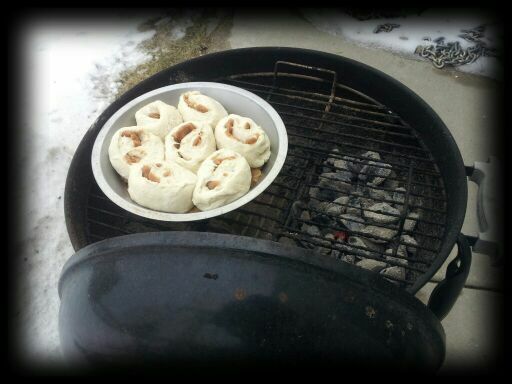 Peach Smoked Caramel Rolls hot off the grill. Man! There may be better things in life, but when you have one of these in front of you, rest assured, you won’t be able to think of any. And neither will your lady.